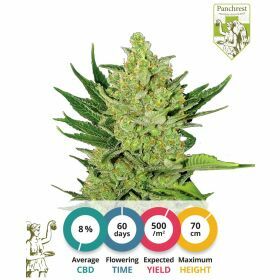 One of the biggest differences with other commercial strains is the flowering time of more than eleven weeks. 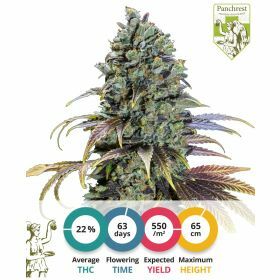 This is not strange for a haze-dominant hybrid, but is something to bear in mind when planning a grow with these Amnesia Haze seeds. The buds that will develop in this extremely long flowering time are well worth the wait. You will not be disappointed by the weight or effect of the buds that the plants that grow from these cannabis seeds produce. 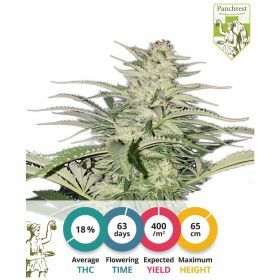 Amnesia Haze is easier to grow than its Amnesia parent, because of the low amounts of stress that the plant experiences from extreme temperatures. However, the grower should be aware of its extreme growth potential. It is not uncommon for these feminized seeds to keep growing vertically for 4 weeks into the flowering phase. Growers with limited height should be aware of this before germinating these cannabis seeds. This strain gives a very hard haze-high. Just like the original Amnesia, this strain should not be used by inexperienced cannabis users. The big difference in effect can be traced back to the haze parents that this strain has. When comparing its effect to the original Amnesia it should be noted that the high is a lot stronger, but the couch lock effects are a lot less strong. 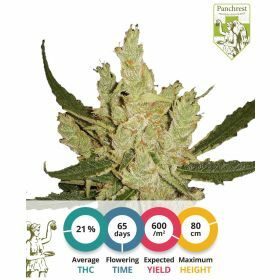 The end product of these Amnesia Haze cannabis seeds is renowned for its effect on the memory. Smoking it will make sure that you forget things, so do not use it when you still have things to do.